Someone is going to be killed, soon, in a highway shootings. The handwriting is all over this one. We've seen times like this before. Highway shooters and snipers targeting apparently random individuals from along roadways, hillsides, and who knows where. Who will be the person killed in the distractions of all the highway shootings happening now? 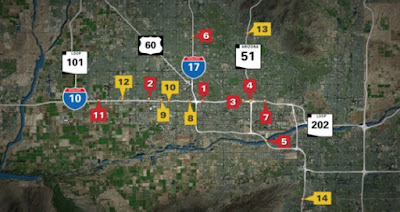 The media, in early September 2015, has focussed on I-10, near Phoenix, Arizona. "Eleven shootings in 11 days" read reporters on their newscasts, and the news headlines on September 10, 2015, told us "Phoenix Sniper Strikes Again: Arizona Cops Confirm 11th Freeway Shooting." 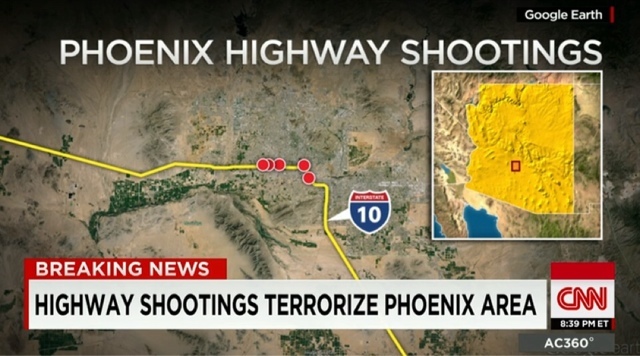 CNN proclaimed "Phoenix Interstate-10 shootings: Copycat may have struck." 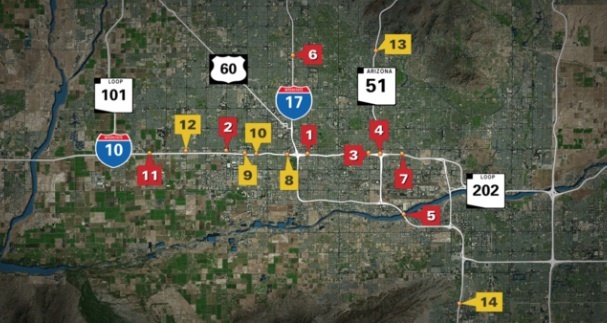 "11 shootings in 11 days along busy Phoenix highway," says the Las Vegas Review-Journal. But beyond Arizona, did you realize that during the end of August and September 2015, car shootings have taken place in Ohio (Akron, Cleveland, Cincinnati), North Carolina (Durham, East Charlotte), and Michigan (near Grand Rapids), in addition to the Arizona shootings along Phoenix's I-10? Two vehicles, a commercial truck and a car, were shot about 3:20 a.m. Tuesday, September 1st, on Ohio 8 in Akron. A 35-year-old man in a car was hit in the leg. 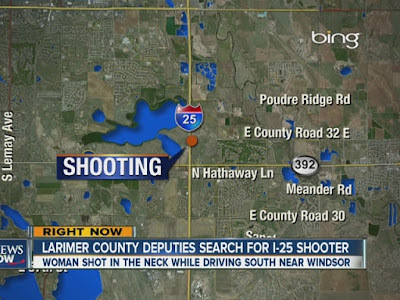 Witnesses told police the gunman fired shots from an SUV driving in the same direction. In Cleveland, Ohio, an officer reported that someone shot at his police van about 11:30 p.m. Saturday, August 29, 2015, as he drove along St. Clair Avenue between East 140th and East 148th streets. The officer reported hearing two shots fired. 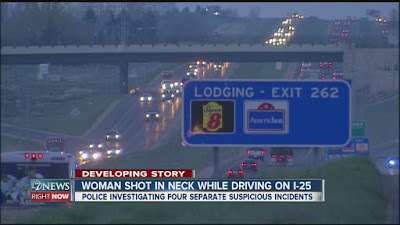 Shortly before midnight on Sunday, August 30, 2015, a car was shot by someone traveling in another car as they drove along I-75, according to the Cincinnati Enquirer. 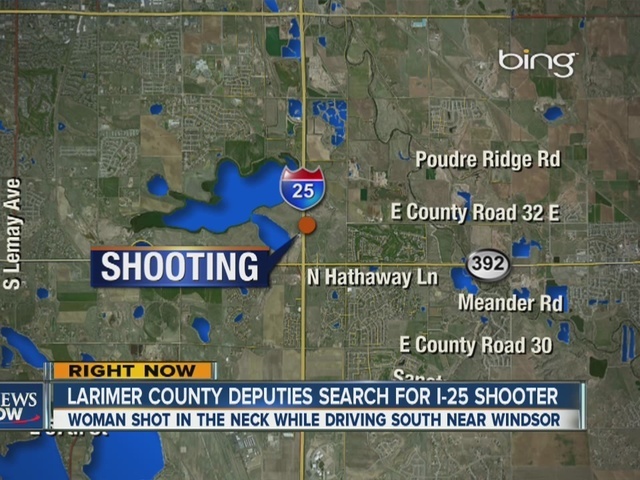 Three people were shot, including one who was severely injured from shots fired from a rifle. The passengers in the car that was hit were on their way to a nightclub. 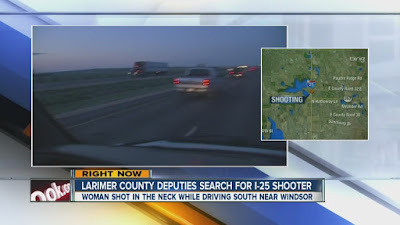 In southwestern Michigan, at least five cars were struck by what investigators believe were bullets from between July 29 and Aug. 21, CNN reported. 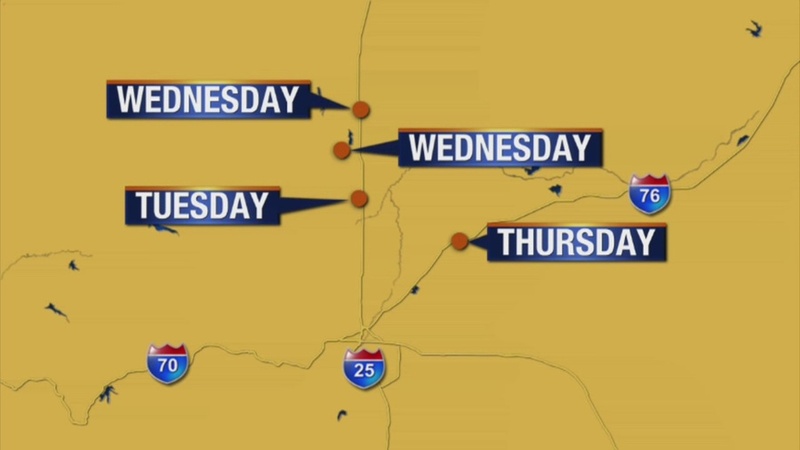 Most of those shootings — on I-94 and I-69 in Calhoun County — happened during the daytime, according to Channel 8 in Grand Rapids. No one was injured, but police believe the shootings are related. In Durham, North Carolina, a man was shot in his torso about 3:30 a.m. Saturday, August 29, 2015, according to WRAL-TV. A woman riding in the passenger seat was shot in the leg. In East Charlotte, North Carolina, a man driving about 6 p.m. Saturday, August 29, 2015, was shot. The man told WSOC-TV that the shooter's car swerved up behind his car, then fired one shot that hit his car. 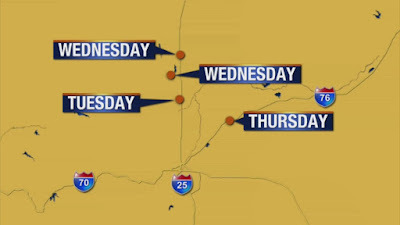 And, as you know, in Phoenix, Arizona, someone or some people have shot at 11 cars driving on Interstate 10, according to the Arizona Department of Public Safety. 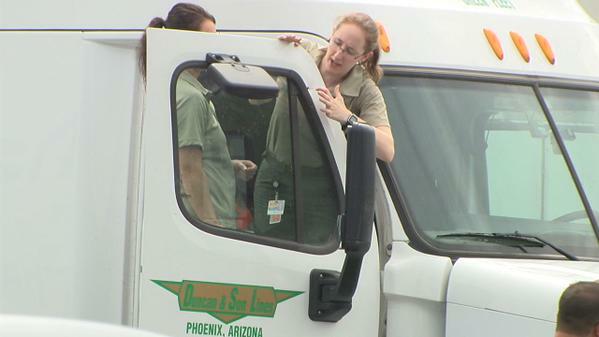 One injury, a 13-year-old girl suffered a cut to her right ear occurred. In April 2015, there was a shooter or shooters along highways in Colorado. With the Phoenix media attention, needless to say, there will be copycats. And it will get deadly. Killers have tended to hide their true motives in the midst of waves of shootings like these. Where is all of this leading? I'm afraid to say someone is going to be killed on a highway from a mystery sniper, if the past is any indication. We are living in an era of random violence, of course, but my mind also goes to the traditional Fortean topic of phantom shooters. A little googling turns up this webpage from 2010, a collection of news items (which in remarks near the end cites you as one of its sources.) The first item starts off, "Joliet, Illinois, late May of 1952, two drivers along Route 66 reported to police that they were fired upon by an assailant in a blue car. One driver received a minor wound. Shortly after, another driver south of Lincoln reported being fired upon by some driving a blue car. Police filed reports and did some looking around but found nothing. On June 2nd, Edward Smith reported being 'ambushed' by someone who jumped into a blue car and vanished up Route 48. Police were now very concerned and were frantic trying to find the assailant that the press dubbed 'The Blue Phantom of Route 66.' By June 10th, 11 people would report being fired upon, one of them a patrolman who gave chase to the vehicle but could not overtake it." As Charles Fort constantly reminds us, the real shades into the anomalous which shades into the outright impossible. And how many of these phantom assailants have never done serious injury but have vanished as mysteriously as they appeared? Also had a drive by shooting on I-49 in Missouri earlier this week. Ah, I see you'd just mentioned the Blue Phantom in your previous entry. (Did you not post that one to Facebook? Somehow I missed it.) But the point remains that not all of these assailants can be explained in rational terms. Just to latch on to your 11 link.. So you could write it as.. Anyway you slice it, it always ends as 11. Excellent research, I myself am consumed with the use of multiples of 11 (22, 33, 77, etc) in these crimes and events.